Built for professionals, the Magicard Rio Pro Printer provides superior printing quality with many available options. The printer is also available as a dual side printer or the single side printer can be converted to a dual side printer with a field upgrade kit. 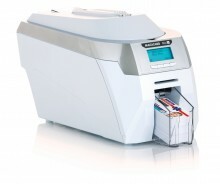 The Magicard Rio Pro is capable of batch or single card printing with secure encoding options for magnetic stripe or contact/contactless smart card technology. HoloKote® security technology enables the Rio Pro to add a watermark to cards as they are printed for increased security. To determine if this refurbished printer matches your individual needs, please call SafeCard ID toll-free at 1-888-485-4696 for a free consultation with one of our experts. The Rio Pro is supplied with a free, 3 year manufacturer warranty with hassle-free printhead cover and loaner service.